The Griot Project Book Series here at Bucknell University Press also seeks to celebrate African American culture, exploring the aesthetic, artistic and cultural products and intellectual currents of historical and contemporary African America and of the African diaspora. 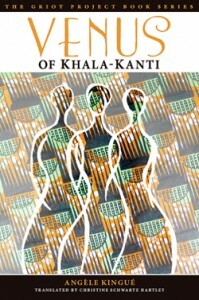 Our newest additions to the series in our partnership with the Griot Institute for Africana Studies are James Braxton Peterson’s In Media Res: Race, Identity and Pop Culture in the 21st Century and Angèle Kingué’s Venus of Khala-Kanti. In Media Res, edited by James Peterson, is a manifold collection that reflects the intersectional qualities of university programming in the twenty-first century. 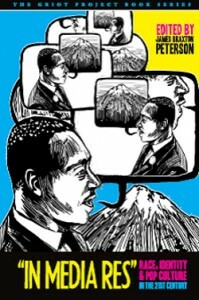 Taking race, gender, and popular culture as its central thematic subjects, the volume collects academic essays, speeches, poems, and creative works that critically engage a wide range of issues, including American imperialism, racial and gender discrimination, the globalization of culture, and the limitations of our new multimedia world. This diverse assortment of works by scholars, activists, and artists models the complex ways that we must engage university students, faculty, staff, and administration in a moment where so many of us are confounded by the “in medias res” nature of our interface with the world in the current moment. Featuring contributions from Imani Perry, Michael Eric Dyson, Suheir Hammad, John Jennings, and Adam Mansbach, In Media Res is a primer for academic inquiry into popular culture; American studies; critical media literacy; women, gender, and sexuality studies; and Africana studies. So as the month of love comes to a close, think about its significance as Black History Month too! Expand that love to engulf the dynamic past and rich culture of the African American. Happy February! Happy Black History Month!